Gambetta says his team had to carefully design its new chip to overcome interference problems caused by putting the four qubits so close together. They are already experimenting with a chip that has a grid of eight qubits in a two-by-four rectangle, he says. Truly solving that problem requires going one step further than IBM’s latest results, and correcting qubit errors as well as detecting them. That can only be demonstrated on a larger grid of qubits, says Laflamme. 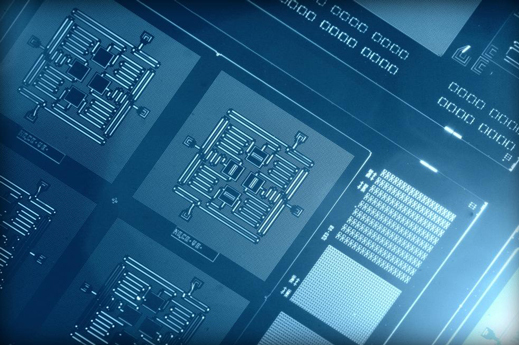 However, not all quantum computing researchers think that qubits like those being built at IBM, Google, and elsewhere will ever be workable in large collections. Researchers at Microsoft and Bell Labs are working to create a completely different design of qubit that should be less prone to errors in the first place (see “Microsoft’s Quantum Mechanics”). This entry was posted in QUANTUM PHYSICS, TECHNOLOGY and tagged COMPUTERS, quantum computers. Bookmark the permalink.